So did they call this bill the Consultant’s Full Employment Act of 2012? CHSRA has blown through almost a billion, and not a mile of track laid. So the legislature decides to throw another $68 billion at it, while the state has a $16 billion deficit. A fraction of that money could have been invested in making improvements in traditional rail to boost ridership, but no. The magpies in the Legislature are distracted by something glititery and shiny called HSR. So did they call this the Killing American Colonists Act of 1776? Gen. Washington is down to 5000 soldiers with most enlistments up in a matter of weeks. So Congress decides to throw more money at independence. The Revolution will be over before you know it. Many rail supporters who initially supported HSR have been appalled at the way the CHSRA has squandered millions of dollars, released false or misleading data and alienated stakeholders. I am one such supporter. 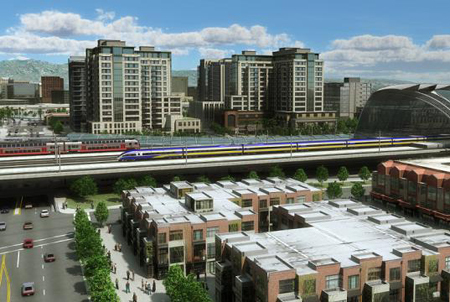 HSR fanboys giving their unwavering support to CHSRA is not helping the cause of rail in California. The politicians and consultants will line their pockets whether HSR gets built or not. I’d love to see your analysis of the Eastern Span of the Bay Bridge. pchazzz – you’ve struck gold. People like Martin Engle who want to kill the project have come up with a wonderful strategy. Convince the people on the peninsula that the line as originally planned will destroy their neighborhoods, and that the “blended” plan is better. So they rally around that, get Scanlon to get in line because if that construction starts he looks good because Caltrain is finally getting electrification dollars. Then, as soon as that becomes the plan, use your other mouthpiece to talk about how the statute is now being violated because the trips will be too long.